The original print and web versions of this report contained an error in the narrative description of the “SSI Recipients, 1974–2010” charts in the Children section. The number of blind and disabled children receiving SSI payments in 1996 was incorrect. The correct number (955,000) now appears in the web versions of this report. Fast Facts & Figures answers the most frequently asked questions about the programs SSA administers. It highlights basic program data for the Social Security (retirement, survivors, and disability) and Supplemental Security Income programs. 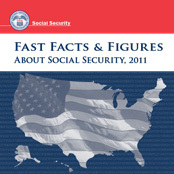 Most of the data come from the Annual Statistical Supplement to the Social Security Bulletin, which contains more than 240 detailed tables. The information on the income of the aged is from the data series Income of the Population 55 or Older. Data on trust fund operations are from the 2011 Trustees Report. The tables and charts illustrate the range of program beneficiaries, from the country's oldest to its youngest citizens. In all, about 59.2 million people receive some type of benefit or assistance. Shirley Turpin prepared this chartbook. Staff of the Division of Information Resources edited the chartbook and prepared the print and Web versions for publication.